When was the last time you read the ingredient list of the products on your bathroom counter? To Be The Architect’s co-founders, actor Hill Harper and entrepreneur Jean-Marc Piquion, you should probably be paying more attention. After both being touched by cancer, they were surprised by the many toxic chemicals found within popular shampoos, body washes, and lotions. Thus, Harper and Piquion set out on a mission to create a skin and haircare brand that contains the highest quality ingredients, creating products that are good for the skin, without breaking the bank. Read on to hear from co-founder Jean-Marc Piquion on how Be The Architect was born, the importance of clean beauty, and how its founders are disrupting the beauty industry as we know it. What is Be The Architect and how did it start? Jean-Marc Piquion (JMP): Be The Architect was co-founded by myself and Hill Harper after realizing that we shared a common battle, journey and mission. 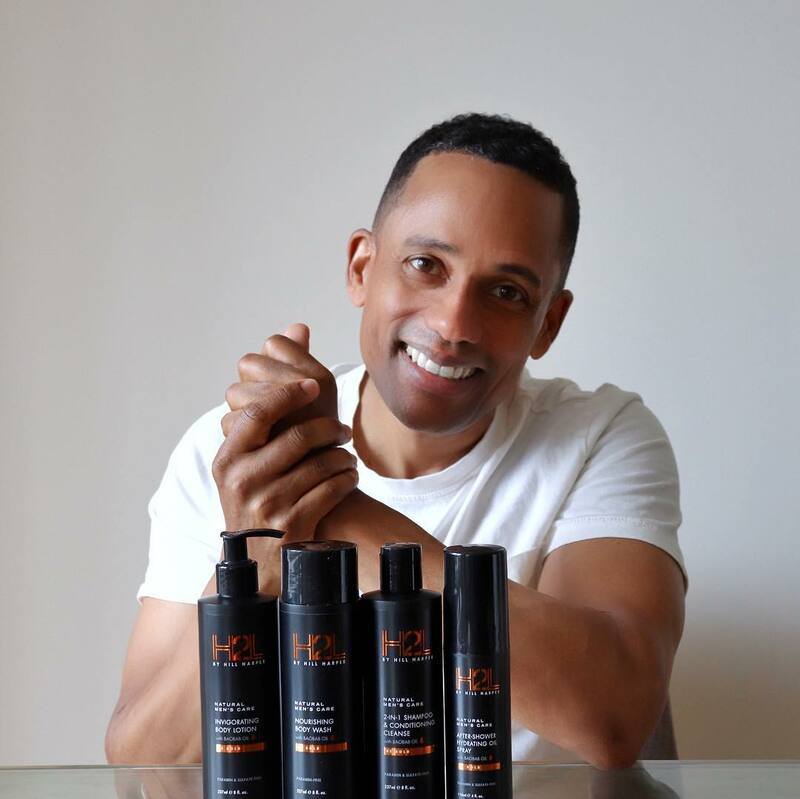 Hill Harper is an award winning actor, philanthropist, New York Times best-selling author, and cancer survivor. I’m an entrepreneur, brand builder and marketing strategist. I also happen to be the father of a cancer survivor. Without knowing each other at the time, both of us struggled with our unique cancer diagnoses in the fall of 2010. We were both fortunate; Hill overcame thyroid cancer and my son beat leukemia. However, these life events led us both to start educating ourselves more on cancer and the harmful toxins that we consume that are linked to cancer. In fact, Hill served on President Obama’s cancer panel. Life brought us together in 2015 and Be The Architect was born. Our mission is simple but powerful: to provide premium personal care products at affordable prices free of harsh chemicals, while bringing awareness to the importance of using safe products for your skin and hair. At Be The Architect, we want to empower people to make bold decision about their health and wellness, creating a blueprint to a healthier life. What is the retail pricing on Be The Architect’s lines? Is everything made in the U.S.? JMP: We are proud that all of our products are made right here in the USA in Miami, Florida, where I live. You don’t have to go far to create healthy, affordable products. Our retail price points have been formulated with the typical health conscious consumer in mind. We want our products to be accessible by all- natural and healthy products shouldn’t be so expensive that only a select few can afford them. We offer a premium hair and body collection for women with body-wash, shampoo, conditioner, after-shower hydrating body oil and body lotion for $65. For men, we have 2 sets to choose from. The premium hair and body collection includes body-wash, 2-in-1 shampoo and conditioner, after-shower hydrating body oil and body lotion for $55. The full shave kit come with a high-end razor, 10 blades, primer oil, shaving lotion and after-shave balm for $45. These are great starter kits for the consumer looking to take the first step toward a healthier skin care routine. All kits come in an incredible box which also makes them a great gift. Check out our prices on www.amazon.com/bethearchitect and they are currently on 20% discount! How is Be The Architect different from other skin and haircare brands on the market? What ingredients are in the products that make it healthier than other brands? JMP: Be The Architect’s brands, JUA Essentials for women and H2L for men, are created with an innovative fusion of fine oils, natural plant extracts and ingredients rich in nutrients, antioxidants, reparative and moisturizing elements that enhance the health of your skin and hair. The oil from the Baobab tree, known as the “Tree of Life” due to its vast health benefits, serves as the foundation for the entire range of products. Other key ingredients include oils such as avocado, sweet almond, argan, chia seed and shea butter. The combination of these ingredients in our products make you feel good inside and out, and they are free of harsh chemicals like parabens, petrolatum, aluminum and damaging-sulfates. How can people be more aware of what they’re putting into their bodies? JMP: Read the labels of everything you are putting on your body. As a society, we have become acutely aware of and focused on what we put-inside our bodies, but many people are still not challenging the status quo when it comes to what they put on their bodies. Our skin is our largest organ, and putting products with toxic chemicals on our skin is just as unhealthy and dangerous as ingesting them. Education and awareness is the first step towards making a change. We want to empower people to make the changes that will help them lead happier and healthier lives. In your opinion, what is the biggest myth about skin care? JMP: That skin care products have to be expensive to be good quality. I have personally learned and proven that this is not the case. My wife (an avid shopper with a religious skin care routine) has traded in her luxury lines for JUA not only because she supports my endeavors, but because our products really are that good. What advice would you give someone else who is looking to start their own business? Know yourself – your strengths and your weaknesses and make sure you build a team around you that complements both. Know your customer – at the end of the day, whatever business you create should have the customer at the epicenter. Be prepared for sleepless nights, working for yourself is incredibly rewarding, but it also comes with a tremendous amount of responsibility. Be prepared to lose sleep sometimes and adopt a routine that helps you manage stress. What’s next for Be The Architect? JMP: Right now, we are focused on building the brand, educating consumers and creating a movement about healthy living. In the near future, you will see us expand our breadth of product offerings all with the same mission behind them – empowering you to be the architect of your life! For more on Be The Architect, visit: BeTheArchitect.com and follow along on Instagram at: @BeTheArchitect!